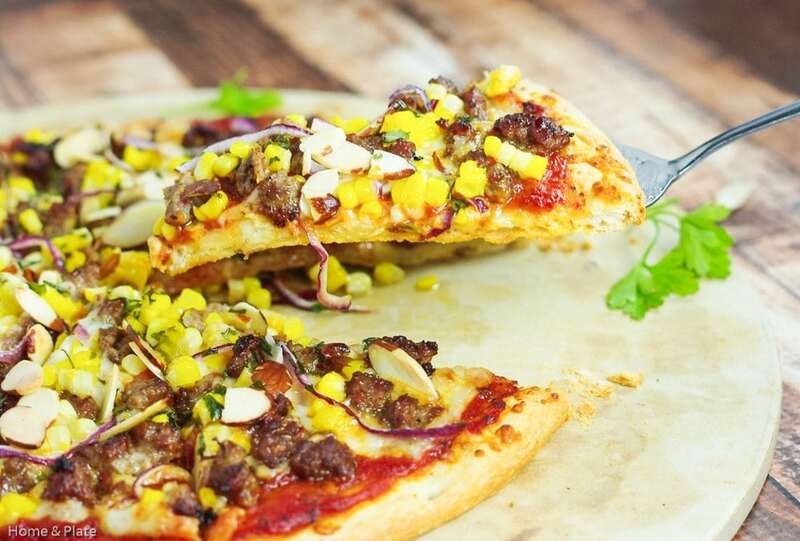 My Sausage Corn & Havarti Pizza pairs sweet corn with spicy hot sausage and toasted almonds for a quick and easy cheesy pizza any night of the week. 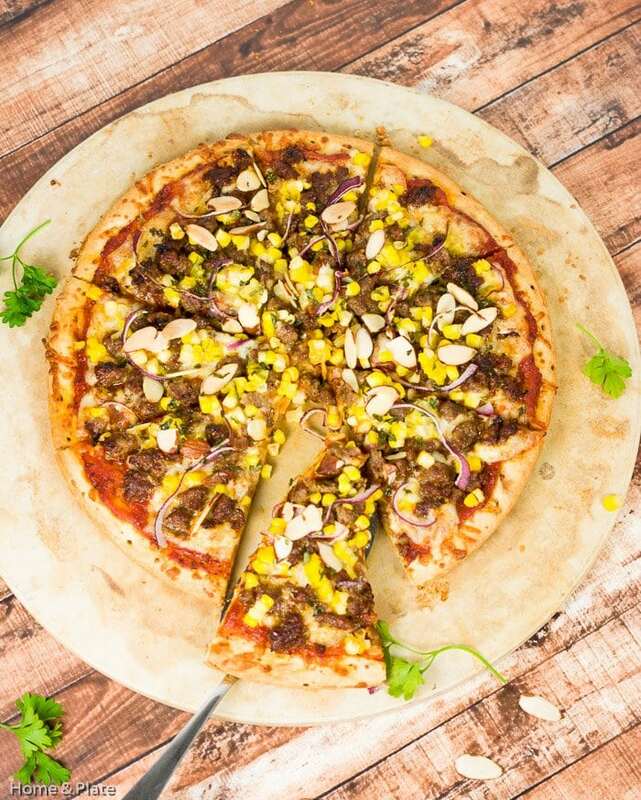 Pair sweet corn with spicy hot sausage and toasted almonds for a quick and easy cheesy pizza any night of the week. Pizza seems to be a staple in our household. I have two teenage boys who can put away a large pizza between the two of them. Pepperoni seems to be the topping of their choice but sometimes the grownups like to eat outside the box. 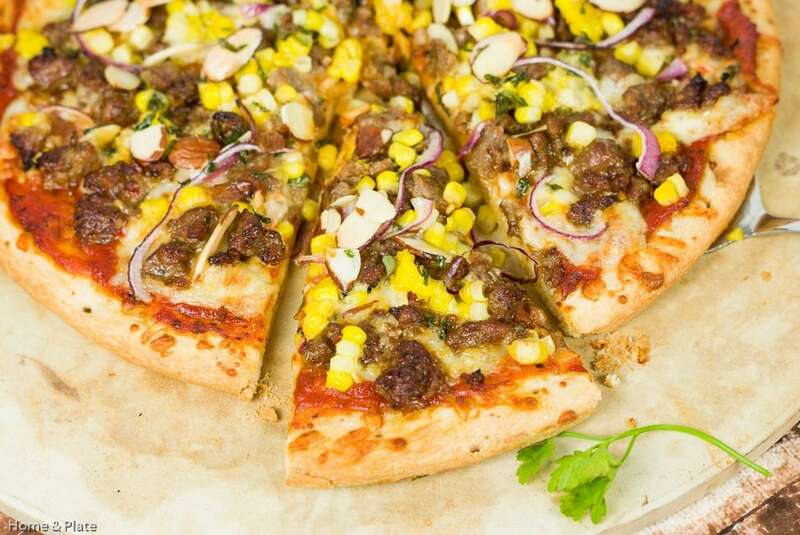 Spicy Sausage, Sweet Corn & Havarti Cheese Pizza is a change from the standard. Hot crumbled sausage or chorizo adds a little heat while sweet corn and toasted almonds lend a sweet and nutty crunch. Havarti is a smooth, buttery cheese that works great on this pizza. 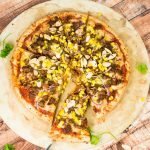 Pizza is really the ultimate comfort food and this recipe would be perfect for pizza night or for a party appetizer. Also be sure to check out my Chicken Barbecued Pizza. Preheat the oven to 375°F. Prepare the pizza shell and spread the pizza sauce a 1/2 inch from the edge. Add the cheese on top of the sauce, ripping the slices into smaller pieces if necessary. Add the crumbled sausage, red onion and corn on top of the cheese and sprinkle on the almonds last. Shake on the dried parsley, drizzle with olive oil and bake for 20 to 30 minutes or until the crust has browned and the onions have caramelized. Allow the pizza to cool for one minute before slicing and serving. Love the flavor combo. Great year round ingredient list, too. Thanks so much. It’s a unique and very delicious flavor combo. I have to have sausage on my pizza. It is my favorite topping. That sure does make for a gorgeous pizza! 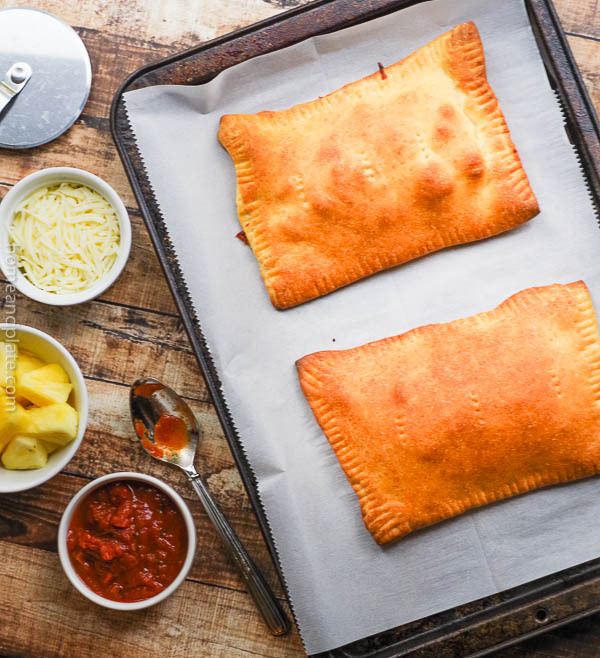 Grown up pizza party? I think yes. Pinning! Thanks Amy! Perfect for the grownups. This looks awesome! A very unique and creative combination for pizza, love it! 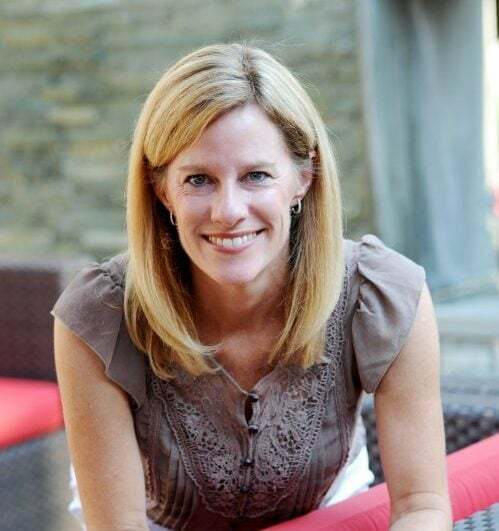 Thanks Julie….love the spicy and sweet together. So yummy.